Spray, play, and then wash it away! 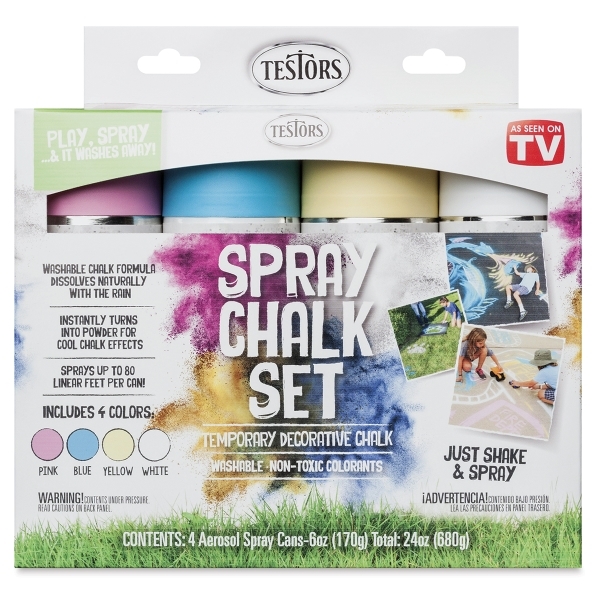 The Testors Spray Chalk Set combines all the fun of spray painting with the easy cleanup of sidewalk chalk. Made with non-toxic colorants, Spray Chalk can go where regular sidewalk chalk can't — spray it on grass, snow, sand, and more. It works great on asphalt and sidewalks, too. The formula is safe for plants and pets. 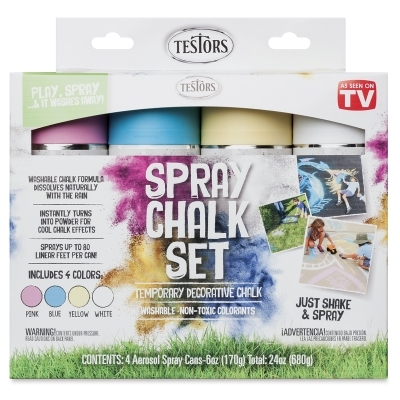 Use the temporary decorative chalk to make outdoor masterpieces, draw signs, and play games. The washable powder dissolves naturally with the rain or can be rinsed away with water. Colors fade to white in seven days. The four-color Spray Chalk Set includes 6 oz (170 g) cans of Blue, Pink, White, and Yellow. Each can sprays up to 80 linear feet. Comfort spray tips make it easy to spray precise lines. Layer the colors to create custom shades.